Multi-flake flooring systems can provide a decorative look to concrete and wood substrates. This easy to maintain system can create a variety of design and layout possibilities. The system can be created using different types of resin bases and textures to fit many requirements. 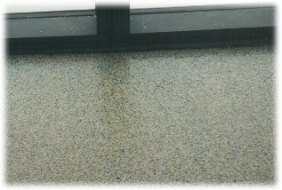 Get the terrazzo or granite look for a fraction of the cost. 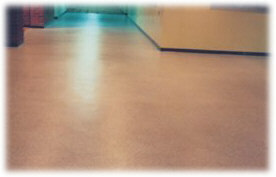 A multi-flake flooring system provides vibrant color and high durability finishes. Custom patterns, shapes and borders will create a unique look, and can add design elements to any area. 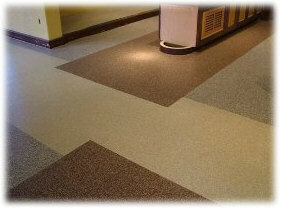 This system is available in 18 standard colors of multi-flake and an unlimited array of custom colors and blends. Also, there are 3 sizes of chips that can be used - 1/8" & 1/4", and New Mica 1/8" & 1/4" to produce the look you want. Multi-flake flooring systems are suited for high volume foot traffic to light industrial truck traffic. Not only do they enhance the look of the surrounding environment, but they offer resistance against wear, abrasion, and many chemicals. A variety of different surface textures can create a smooth to aggressive ant-slip and everywhere in between finish. Monolithic cove base can be added to this system to produce a sanitary waterproof edge detail. 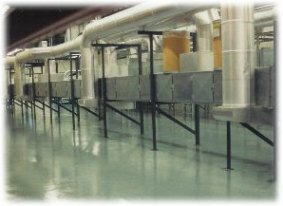 A BIO-PRUF antimicrobial system can be incorporated to provide the floor with long term protection against a broad spectrum of bacterial and fungal attack. It will also help prevent surface growth, musty odors, permanent staining and the development of fungal spores. 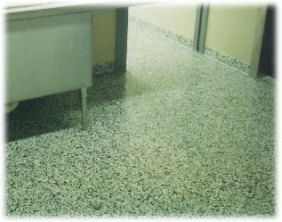 Our state of the art crack repair and resurfacing systems can produce a new looking floor even on old damaged or worn concrete. Uneven or curled concrete problems can usually be cured with our dry, dust-free concrete grinding systems. These systems will build your new flooring system with a solid foundation. Multi-flake flooring creates a great first impression when utilized for entry ways or foyers. 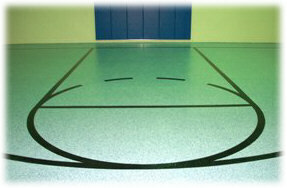 It produces the look of a clean, well maintained facility. With proper care and an occasional top coating, this system will provide many years of low maintenance NO strip or wax performance. High performance urethane topcoats can improve ultra-violet and abrasion resistance where heavy traffic and high levels of sunlight is expected. This flooring system finds it's way into a multitude of decorative applications and has worked well for many applications you may not have thought of... so use your imagination. Integral cove base adds the look and function of a molded, well sealed, and sanitary edge, while providing a water tight edge to walls. The radiused edges will also aid in wash down and everyday cleanup, preventing debris from getting caught in a square corner along walls.